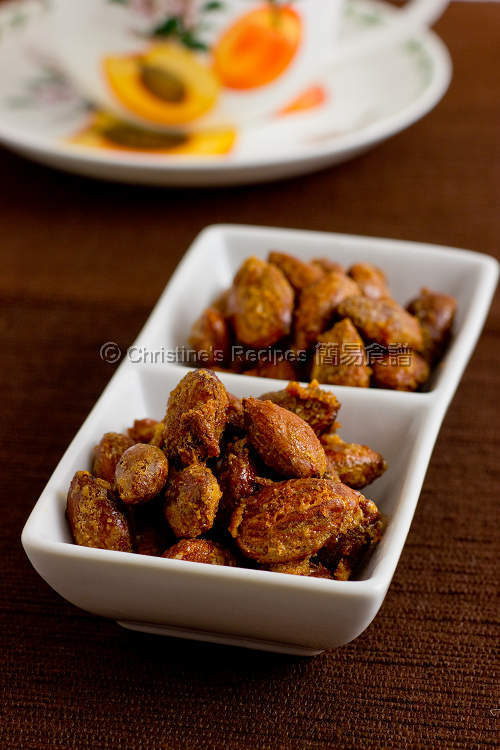 Roasted almonds as snack? Yes, I like munching a handful of almonds while writing posts, or using some to whip up dessert after dinner, or grounding some to blend with yoghurt as morning tea. Needless to mention how nutritious nuts are. Almonds are one of the popular nuts that served as snack on its own, rich with protein, calcium and iron. I got some beautiful raw almonds the other day, then roasted them for snacking at any time when I’m craving. Preheat oven to 170C / 340F. Place the almonds on a lined baking tray in a single layer. After baking for about 3 minutes, stir the almonds to help bake evenly. Continue to bake for another 3 minutes, or until aromatic. Remove from the oven. Let them cool on a wire rack. Combine the sugar and salt. Mix the egg white with vanilla extract well. Stir in the sugar and salt. Add the almonds and coat well. Transfer the almonds onto the lined tray. Bake in the oven at 160C / 320F, about 20 minutes. Turn off the heat. Let the almonds stay inside the oven until almost dried. Remove the tray from oven. Let the almonds cool on a wire rack completely. They can be stored in an air-tight container for up to 3 weeks or so. You can use roasted almonds for convenience. 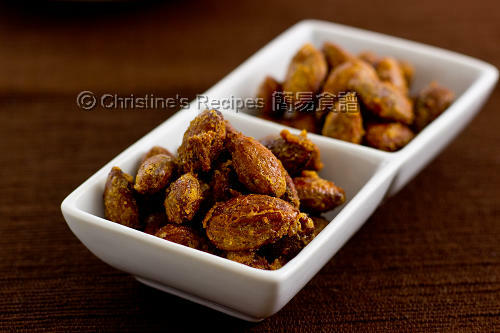 But raw almonds are best for this recipe, available at supermarkets. 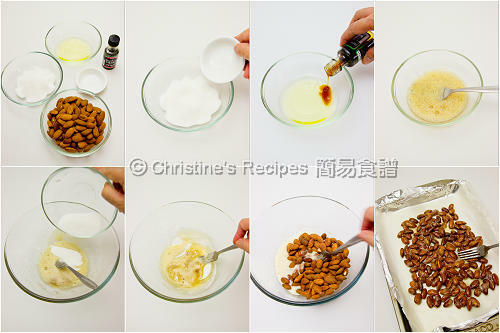 After coating with sugar, the almonds can be burnt easily within minutes. Thus, don’t leave them unattended. The power of every oven is very different. Please adjust accordingly. It sure looks real crunchy.....just great as munchies and snack. Love to try this one day and thank you for sharing. Just tried this recipe with great success as with your other recipes. I am wondering if I can do the same with walnuts. If so, when should I add the sesame seeds? This recipe works with walnuts too. Actually I did before. You can add sesame seeds 5 to 10 minutes towards the end of baking. Thanks for your recipe, Christine! I tried it out for my girl's birthday party and it was a success. I think the adults likes it more than the kids!